Water can be the hardest thing to drink, even though it’s the most healthy drink for us out there. Not to mention that water is vital for our health, and we need to drink a certain amount everyday to stay hydrated. Sometimes, no matter how many lemons you put into your water to give it some flavor, it’s just not enough. And if you’re like me who tries to stay healthy but gets tired of water, then listen up. Coconut water is one of America’s new crazes, but as an Asian from a tropical country, it’s nothing new to me. Back home I would drink coconut water (and its coconut “meat”) because it was always served as a casual beverage, like lemonade to Americans. I could easily buy coconut water from street vendors, who sold them for less than a dollar per coconut. What I didn’t know then is that coconut water contains a lot of supplements that are beneficial for our health. With only 60 calories, coconut water contains potassium and glucose used to lower our blood pressure and supply sugar needed for energy, in addition to vitamin C and B.
I definitely recommend switching your sports drink to coconut water because it has less sugar and more potassium. The sweet flavor of coconut water even has less sugar than most fruit juices… and soda, obviously. However, as amazing as coconut water sounds, there is a limit to it. You have to be aware that it does contain sugar, and consuming a couple bottles a day is equivalent to consuming other sugary drinks. 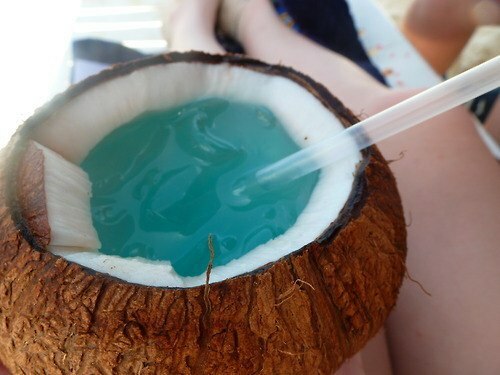 Regardless, it will be one of the most refreshing drinks you will ever taste, and it’s definitely worth a try. Now, being in the landlocked city of Columbia, Mo., I did suffer from withdrawal for a couple months. The coconut waters found in chained supermarkets just weren’t as fresh as I wanted it to be, and the flavor just didn’t taste the same as the coconut waters I drank back home. That was until I found Harmless Harvest’s 100% Raw and Organic Coconut Water available at Clover's Natural Foods. Its flavor was similar to the ones sold by the street vendors: natural and fresh. It turns out that this is because the bottle that the water comes in are designed to apply pressure to the water the same way that it would in an actual coconut. And there’s a price to pay for that: Each bottle ranges from $2.50-$4 in price. For a cheaper alternative, I recommend Chaokoh’s Young Coconut Juice for only $1.25 a can, available at Chong’s Oriental Market. Sadly, it also contains coconut pulps (the “meat” I was telling you about earlier), which brings the calories up to 220. But it won’t hurt to enjoy for self-indulgence once in awhile, right? So for a healthy, refreshing drink that will make you feel like you’re on a tropical island with every gulp, will you save ... or will you splurge? This piece is part of Sazanka Idris’ weekly lifestyle column, “Save or Splurge,” which compares products or services to help college students manage their budgets.